My Human Rights are Not Changeable. 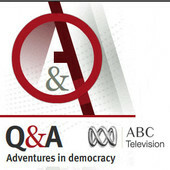 I’m a keen watcher of Q&A on the ABC. I love the political discussion. Michael and I fire up our laptops and tweet away. I become fully engaged in the conversation and the questions. We make comments to each other, interact with our Twitter and Facebook friends, at times I yell at the screen. It’s a fun night all round. Something has set me off on tonight’s show. There really was a lot there that I feel quite strongly about, Graeme Richardson telling us what the Labor Party should be doing, Judith Sloan calling Childcare workers ‘dimwitted’ and discussion on violence against women. Those topics alone got me going, but I’m really quite disgusted. I can’t believe what I heard and the sense of personal outrage in me was enormous. DISCRIMINATION IN AGED CARE – Alastair Lawrie has asked: Senator Brandis: On Tuesday night, you stated the Opposition would block any anti-discrimination bill that does not allow religious organisations to discriminate against older LGBTI people in aged care facilities. You claimed that religious freedom trumps the right not to be discriminated against. I’ll wait to see the transcript, but it seems to me that Brandis is perfectly happy to allow religious rights to trump sexuality rights. He said that anti-discrimination laws should not be universal. He said religious freedom trumps that of sexual freedom. This is an outrageous position for a member of our Parliament to hold. Brandis may well be the next Attorney-General. You can change your religious afflictions, not so much your sexuality. The only people who think you can change your sexuality, or even want you to change your sexuality are religious people. Yet my rights, if Brandis got his way, need to be dictated by the rights of a religion because my unchangeable sexuality offends them. Let’s see. I can’t change my gayness. Can’t even turn it down a notch or two. Religion on the other hand changes all the time, indeed has shown itself to be changeable. I am able to carry out my life and not impact on religion at all. I made a choice to walk away from supernatural belief. I am not evil, I am not out to bring society down, I am not gay because of some choice I made or because my father was absent, or whatever mumbo jumbo religion throws at me. What next. The right to vote is restricted to men? Pretty sure I know which rights should be trumping here. Update: 25 June 2013 – 8.30 a.m.